Traffic congestion, bad roads, road rage and scant regard for traffic regulations is what you are likely to face while driving in India. If you are an expatriate, chances of driving in India could prove to be a challenging task. The condition of roads in India is far from satisfactory. It is only in metropolitan cities that you will find roads in good condition. In rural areas the situation could prove to be alarming as very often roads are not even tarred. Pot holes, poor lighting and low maintenance seem to be the order of the day with a few exceptions. The traffic police and the enforcement wing of the transport department are the two authorities that regulate traffic in India. In case of violations of any traffic rules, action will be taken under the provisions of the Motor Vehicle Act 1988. Driving licenses in India are classified in to learner's license, permanent license and licenses to drive vehicles with gear, without gear, two wheelers, four wheelers and heavy motor vehicles. You will have to appear for a computer based test and a driving test to get a license. Documents required to be submitted for obtaining a driving license are: proof of age, proof of residence and four recent passport size photographs. The fee payable depends on which category and how many categories of vehicles you need a license for. International driving licenses are also issued in India. You will have to produce a copy of your visa and passport for the same. Always keep a copy of your license handy as traffic police will ask you to pay a fine if you are found driving without a license. Traffic signals may not work in some places due to power failure or simply because they are out of order. Road markings are used to indicate lanes and directions. The traffic police use hand signals to direct and regulate traffic. Even motorists' use hand signals to indicate where they are going. For instance: simply putting your right hand out indicates that you would like to turn right, waving your right hand forward is an indication to the person behind you that he may overtake you and so on. 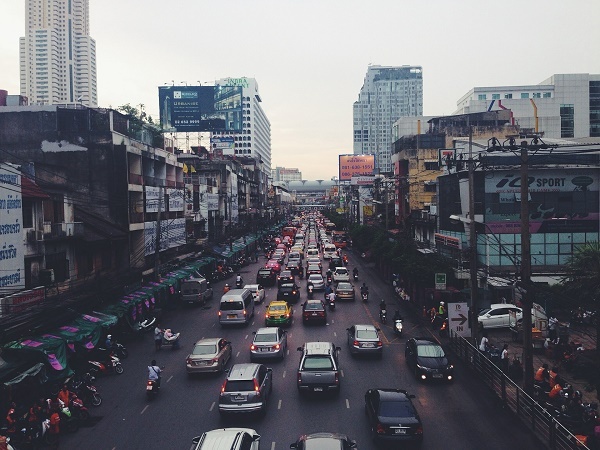 Traffic in India is a mix of people riding bicycles, motorcycles, auto rickshaws, animal driven carts and cars. You will have to deal with instances like animals sitting in the middle of the road too. Follow the rules for your part but patience and consideration will help you navigate Indian roads with ease. Avoid driving late in the night, even in cities. Instances of drunk driving and road rage in India are numerous and many go unreported so it is important to be cautious on that front. Driving on highways is dangerous and when in doubt, the slower the better. Most roads, particularly those in mountainous areas, do not have railings on the valley side. Do not drink and drive as traffic police in most cities are carrying out surprise checks with a view to curb drunken driving. People rarely stick to their lanes and you must always be alert.